Saladas are more than a mere cracker. In fact, I might go so far as to call them an icon. The seemingly humble cracker may lack the pizzazz of flavour-blasted, modern-day snack foods, but it's the salada's simple nature that makes it infinitely adaptable to all sort of culinary applications, from appetisers to dessert. 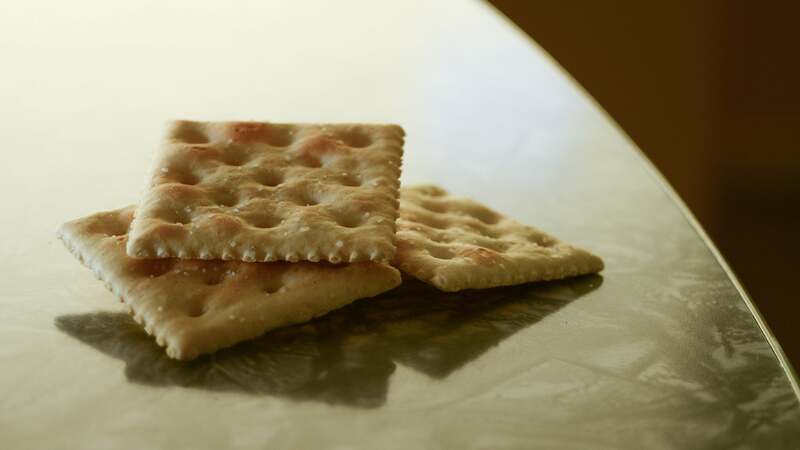 As a snack cracker, the salada excels. It can be topped with almost any cheese, though pimento is its best friend. Saladas also do well in dips and spreads of all sorts, but I'm not here to tell you how to put stuff on crackers; I'm going to tell you how to make crackers the star. You can also add garlic powder, onion powder and black pepper to taste, but the above are the necessities. Place the crackers in a single layer in a seal-able plastic container (or throw them in a freezer bag), and mix the oil and seasonings together in a bowl. Drizzle the oil over the crackers and let them hang out for at least half an hour, gently shaking them every 10 minutes or so to coat. You can then eat them as is, or you can pop them in a 120°C oven for 15 minutes to crisp them up. In addition to acting as a cheese transportation system, saladas can also help your food keep it together until it makes it to your mouth. The crisp and salty cracker is a great binder for foods like meatloaf, meatballs, and crab cakes, and they make an excellent, quick and simple breading. Toast them with a little butter (or maybe just grab the fire crackers from above) and they make a great topping for macaroni and cheese, casseroles, or any baked dish that could use an extra bit of comforting crunch. Because they're not aggressively seasoned with cheese powder, garlic salt, or whatever the heck is in Chicken In a Biskit crackers, saladas can be used in surprisingly sweet applications. Beyond spreading on some Nutella and sprinkling on some huge flakes of Maldon, saladas can be fashioned into a pie crust, used in some very serious ice cream sandwiches or, in the case of salada toffee bark, be the sweet end to a lovely meal. Anything else you'd like on these crackers, such as chopped nuts, pretzel bits, shredded coconut, etc. Place them in a single layer on a cookie sheet and combine butter and sugar in a sauce pan and boil for three minutes, pour over the crackers and bake in a 200°C oven for five minutes. Remove from the oven, sprinkle on the chocolate chips, and let them sit for five minutes, until melted. Spread the chocolate around to coat the crackers, sprinkle on your other toppings, and let it all cool completely. Devour and be happy with your choices.